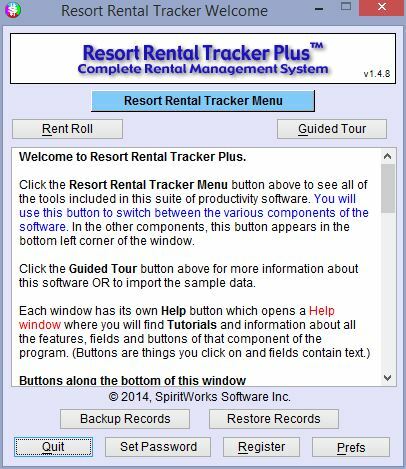 "Resort Rental Tracker Plus is a simple rental organization program for resorts, or anything similar, for tracking billing and tenant information." Resort Rental Tracker Plus is a simple rental tracking organization program for resorts, or anything similar, for tracking billing and tenant information. You might find this software very useful if you are an apartment complex, hotel, or of course, a resort. This simple to use application keeps organized data on the finances and tenant information for your company. With Resort Rental Tracker Plus for Windows, you are greeted with a small simple window that gives you all of the options you need to get started. You can manage any number and type of resort units including camp sites, cabins, RV sites, boat slips, and more! SpiritWorks Software Inc. has ensured maximum flexibility to make sure your reservation information is organized right and easily manageable. The many different types of features you are able to access and use to your benefit is what makes Resort Rental Tracker Plus for Windows very appealing for resort, hotel, apartment, or RV park owners. You have two visual occupancy tools, the Resort Map, and an Availability Checker, which shows seven weeks in advance. Easily organize all of your rental activities, whether it is reservations, rent collection, tasks, contract, and even appointments. Resort Rental Tracker Plus has got all of your time management and organization needs covered. With this software, you are even able to accept online credit card payments. 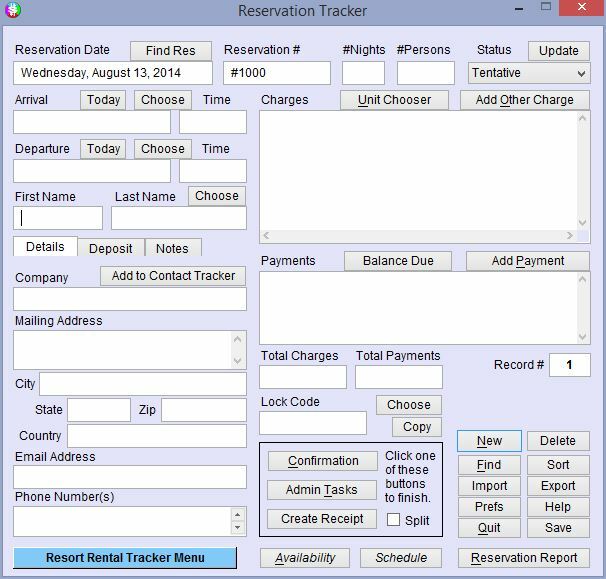 The Resort Rental Tracker Plus's reservation software system also integrates with WebReserv, which is a well known online booking service. Your company can benefit from WebReserv's online availability charts and all of the many other features of Resort Rental Tracker Plus. With these two appealing options available it will be easy to keep all of your data in sync. One of the most notable features of Resort Rental Tracker Plus for Windows is its Resort Map which can be used for quickly accessing resort information about the unit in question, a reservation or a tenant, as well as recording payments. Fast and with great ease, create tenant receipts, reservations, rent rolls, and many other reports necessary for logging your business' renting information. You are also able to track of all your income and expenses with Resort Rental Tracker Plus. You are able to create account registers for as many accounts as you want, as well as print checks on your current blank checks for speed and convenience.